Prestonwood Forest subdivision was developed during the 1970’s by Marvin Leggett, a real estate developer. He was the general partner of the corporation that put the initial 229 acre land parcel together that later became Prestonwood Forest. 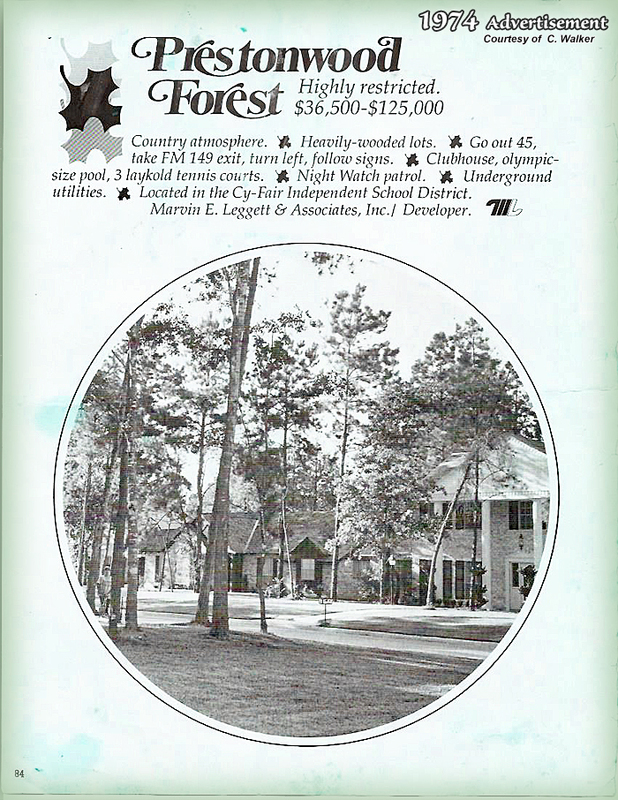 The first official document with the name “Prestonwood Forest” upon it is the Articles of Incorporation which was signed on March 23, 1971 by Marvin Leggett and two business associates. These three men became the first board of the Prestonwood Forest Maintenance Association. Prior to and during 1971 the streets, sewers, electrical service and other necessary infrastructure were installed. The streets and storm sewers are maintained by Harris County, Precinct 4 and the sanitary sewers and drinking water supplies are administered and maintained by the Prestonwood Forest Utility District. 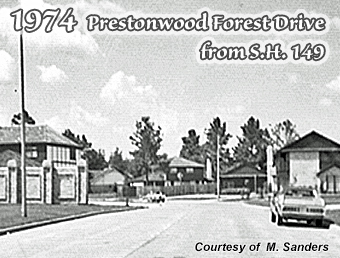 The Prestonwood Forest Utility District was also formed in 1971. Up until 1977, both it and the Tomball Road Utility District served Prestonwood Forest. In 1977 the two were combined into the present facility which is also called the Prestonwood Forest Utility District. The utility district has two water wells, one at the end of Camborne Lane and the other just off Schroeder Road by the Willowood Villas Condominiums. The Prestonwood Forest Utility District has now converted to a surface water supply but still produces some well water for the district. The district also operates a wastewater treatment facility at the north end of Prestonwood Forest Drive and Cypresswood. The residential development began in 1972, along with the construction of the front swimming pool, the clubhouse and the three front tennis courts. 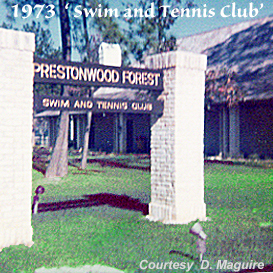 An organization, “Prestonwood Forest Swim and Tennis Club” was established by Leggett to administer the pools and tennis courts. The back pool and tennis courts were built later, about 1975 when the back section of Prestonwood Forest began to develop. The first houses were built in 1972 near the front of the subdivision on streets such as Schaffer, Wimbledon and Coolshire. Over the next five years the development moved north and the last section to be developed (primarily 1975 through 1977) was the area across Schroeder Road, known locally as the “back section”. The three original Maintenance Association members, Marvin Leggett and his two business associates were to serve until 25% of the houses in the initial section were sold, at which time one of the Prestonwood Forest residents was to be elected to the board. The other two original board members were gradually phased out and replaced by Prestonwood Forest residents over time. In 1975 another entity, called Recreation Incorporated, was formed by the residents to administer the clubhouse, swimming pools and tennis courts in place of Leggett’s original organization. Membership in this organization was voluntary, unlike the Maintenance Association. In 1977, Marvin Leggett dropped a bombshell on the subdivision. He said that Recreation Incorporated could buy the clubhouse, swimming pools and tennis courts for $150,000 or he would tear everything down and build apartments in those spaces. Jack Howard, President of Recreation Incorporated and David Nance, a director were designated to be the negotiators with Leggett. The idea of a promissory note was proposed but Leggett said that he was not comfortable with Recreation Incorporated being the sole signers of promissory note because it was a voluntary membership organization and the membership had already slipped somewhat as some new residents had chosen not to join. He proposed that Howard and Nance co-sign the note, a suggestion that was viewed with understandable reluctance. Eventually the stalemate was broken and Leggett (actually his company Pine Grove Inc.) accepted a ten year promissory note at 7% per annum from Recreation Incorporated (with no co-signers). 1977 was an important year in the subdivision history for a second reason. The original deed restrictions had set the annual maintenance fees at $160 per household but they were not indexed for inflation. As a result the subdivision was in danger of running out of money to fund such critical services as trash pickup and security. It was apparent that the deed restrictions would have to be amended to correct this oversight. Amending the deed restrictions is a monumental undertaking. Two thirds of the subdivision households have to approve any amendment. Since there are 785 homes in Prestonwood Forest, it means that 523 votes are needed to amend the restrictions. A home was selected on each block to be a voting center. The first two times the approval was attempted the necessary 523 votes were not obtained. On the third try it was successful and the annual maintenance fees are now indexed to inflation (to be precise, they are geared to the Consumer Price Index). It is very unlikely that another attempt to amend the deed restrictions will ever be attempted. 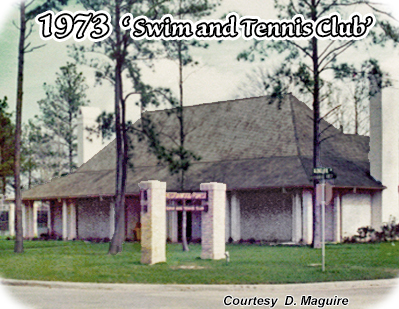 In 1979 the membership of Recreation Incorporated voted to merge their organization with Leggett’s original organization (Prestonwood Forest Swim And Tennis Club) with the eventual surviving corporation to also be called the Prestonwood Forest Swim And Tennis Club. The club was run by a five person board from 1979 to 2000 and was receiving some necessary financial assistance from the Maintenance Association. In May 1982 an amendment to the Maintenance Association bylaws allowed the Swim and Tennis Club and the Maintenance Association to merge financially while still allowing the Club to function as a separate voluntary membership entity. As membership in Swim and Tennis continued to decline and financial problems continued to grow something had to be done. In January 1983, Gary Craig, president of the Maintenance Association and Joe Cameron, president of Swim and Tennis signed an agreement where Maintenance would pay the taxes, mortgage and other major expenses and then lease the facilities to Swim and Tennis. This was a stopgap measure but offered some immediate relief. In September 1988 the Maintenance Association bylaws were amended to allow all members of Prestonwood Forest to use the Swim and Tennis facilities by just paying their annual Maintenance fees. In early 2000, Jack Howard, president of the Maintenance Association and Joan Osborne, president of the Swim and Tennis Club agreed to disband the Swim and Tennis organization and turn all responsibilities over to the Maintenance Association. This agreement was formalized at the May 2000 annual Maintenance Association meeting where the bylaws were amended and two additional board members were added to the Maintenance Association Board to cover the additional duties formerly performed by the Swim and Tennis board, thus raising the Board to nine members. All residents of Prestonwood Forest are now allowed to use the club facilities as well as the swimming pools and tennis courts. In the 1970’s and early 1980’s there were a number of resident organizations in the subdivision. Among these were The Prestonwood Women’s Club, The Prestonwood Civic Club and the Prestonwood Garden Club. There was also a club of all the organizations’ presidents where information was exchanged every month. Of these only the Prestonwood Women’s Club, now morphed into the Prestonwood Forest Senior Social Club, is still in existence. Some other organizations such as the men’s and women’s tennis teams and the Prestonwood Flyers swim team continue to meet on a more or less regular basis. One tradition that has endured is Prestonwood’s Nite of Lites at Christmas. 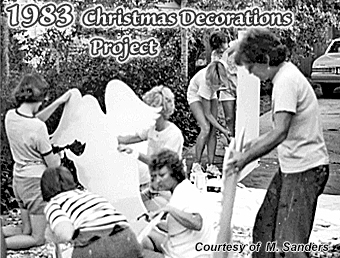 The first block to be decorated for Christmas was the 8100 block of Roebourne in 1977. The neighboring 8100 block of Wycomb took up the challenge and decorated their street the following year. After that the practice quickly spread throughout the subdivision with awards presented for best block, best house, etc. It is now a well-known tradition in the area and every year thousands of visitors drive through the subdivision at Christmas to view the decorations. Access to the subdivision is much better now than it was in the early days. At that time the primary access point was FM 149, later changed to State Highway 249 and then to Tomball Parkway. Now Hargrave road connects to a much improved Cutten Road and also to the Methodist Hospital area. Cypresswood Drive makes it easy to connect to both Hwy 249 and to Cutten Road. In the 1970’s and early 1980’s there were very few retail stores or restaurants situated along FM 1960 (also called Jackrabbit Road at that time). Prestonwood residents would commonly travel to Memorial City Mall or Northwest Mall to shop. For a few years Gerlands operated one of their Food Fair supermarkets at the front of the subdivision in the present day strip shopping center located in front of the Prestonwood Apartments. Prestonwood Forest is still a friendly and peaceful subdivision in which to live as evidenced by the number of children that grew up here in the 70’s and 80’s, and have now married and moved back here to raise their own families. This brief history will perhaps give residents an idea of how Prestonwood Forest developed over time and also provide some insight into some of the politics and problems (now largely solved) that have occurred over the past forty years.